Real $500 Race Cars Have Manual Transmissions... And Inner-Tube Shifter Boots! When we started out to build a V8-powered Volvo 244 for the May 10-11 24 Hours of LeMons race, most of the team members assumed we'd be using the good ol' C4 automatic transmission. You know, automatics are way easier to swap, with no troublesome clutch linkage to futz with. But Crew Chief Hellhammer (formerly known as Dave) pointed out that he's built plenty of manual-equipped rods, and then he directed our attention to several Ford V8-compatible T-5 5-speeds (and no C4s) sitting in the weeds behind his shop (he's been working on a '57 Ford project, so his stash-o-parts is heavy on Ford running gear). With our minds filled with images of slushboxes overheating and dying at last year's Altamont race, we decided to go with three pedals instead of two... then held our collective breath when it came time to make it happen for real. As it turned out, this is a ridiculously easy swap (well, by the standards of weird engine swaps, that is). 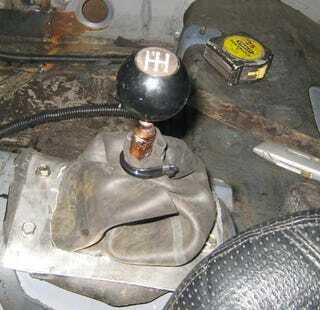 The 5-speed shifter even lined up perfectly with the hole for the Volvo's automatic shifter. A bit of crossmember modification and it was in place. What really had us worried was the potential nightmare of rigging up clutch linkage. We grabbed a Volvo clutch pedal and cable assembly out of a manual-trans 244 at the junkyard and settled down for what threatened to be agony-packed days of fabrication.